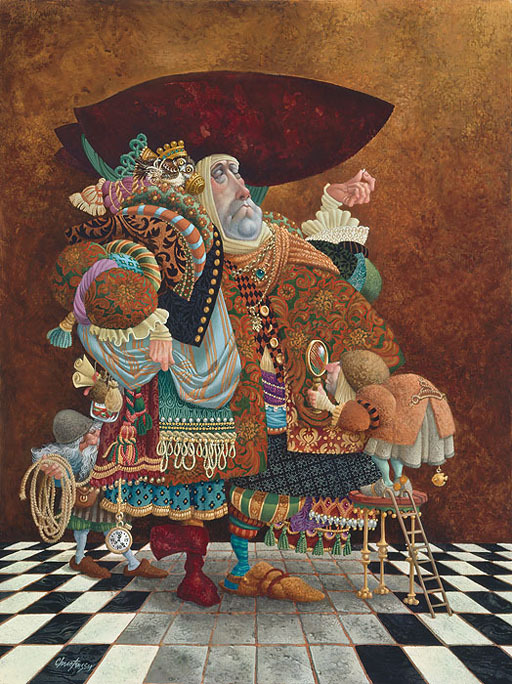 James C. Christensen’s sold-out paper lithograph print of this image graces the walls of scores of attorneys (who, fortunately, all have a great sense of humor.) Now the popular send-up of lawyers is available in a Fine Art Canvas Anniversary Edition. In a world of black and white, this attorney feels more at ease in the gray areas. He contemplates the implications of a grain of truth, which is more than enough for a lawyer to build an entire case. An adequate supply of loopholes is sewn onto his coat. His fashion taste runs toward fine print (albeit he has his assistant check it for him). A stuffed and rather moldy owl sits strapped securely to his shoulder to give him the appearance of wisdom. His watch records the billing hours not in minutes but in dollars and he’s billing you even as you read this! Can you find the “Quart of A. Peels”? This Fine Art Canvas edition comes with a “Notice of Discovery and Inspection” document to further elucidate this upstanding specimen of the legal profession.